Low on cash? Plan a vacay at these uncommon mountain stays that will not strain your wallet. So bookmark em, and jet set go! Nestled among the Delo Hills, Sangsher Village is a beautiful hamlet that is yet unexplored by many tourists. 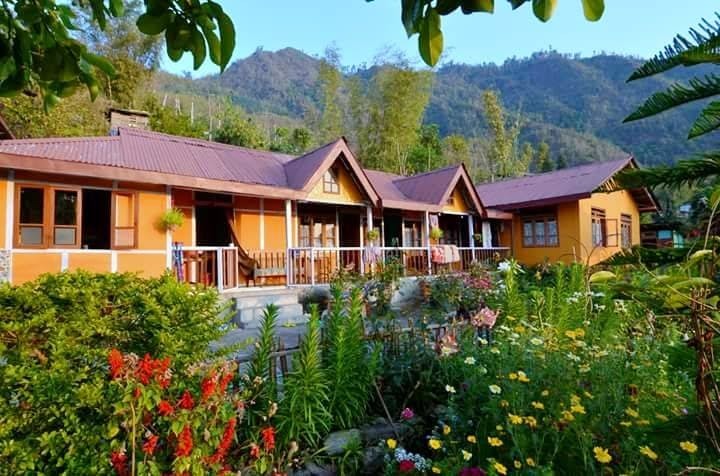 Located in the Sangsher Khasmahal of Neora Valley Park, this quaint village lies in the gateway of Sikkim and North Bengal and affords a view of the Teesta and the Kanchenjunga. The Sangser Homestay (check out the image above) lies 80 km away from Siliguri and has cosy rooms with attached baths. With tasty home cooked food made available to you for all meals this place is a home away from the hubbub of the city. The cost per head for each night is INR 1,250 and includes meals with it. Just 30 km away from the touristy Kalimpong and 15 km away from Lolegaon, the sleepy valley of Charkhole sits on the Eastern Himalayas. Surrounded by pines, cypress, oak and rhododendrons, its is a nature lover’s paradise and a trekker’s delight. The Kanchan View Resort in Chakhole is a beautiful stone house that overlooks the majestic mountains and the lush woods. The wooden interiors of the resort adds to the rustic charm of the place. You can go on a village trail or hike up the nearest hill to explore the abundant flora and fauna of the village. Night time is of course best enjoyed with a bonfire that you can build in the clearing in front of the cottage. You get to enjoy this experience and much more for INR 1,600 per head (inclusive of meals for the day). Located in West Sikkim within the Rinchenpong district, the forest village of Sribadam is a lush hill station that is sure to give you some much p&q. About 42 km away from Darj and 35 km away from Sikkim’s Pelling, Sribadam is an Arcadian village that has waterfalls and rivers meandering through its lush green cover and monasteries and meditation centres dotting its face. With Buddhist bric-a-bracs spread across this wooden cottage, the Srbadam Homestay is a perfect place to stay and soak up the moods of nature. Costs per head include meals for the day, and each night is priced at INR 1,300. At least 1400 ft above sea level, the remote and scenic village of Samathar Valley lies 42 km away from Kalimpong. This lepcha village is surrounded by arching hills, dense forests and mountain streams. With terrace cultivation happening all around this place Samathar is known for its mountain agriculture, river valleys and divers flora. The gabled-roof wooden villa in Samathar affords you a panoramic view of the surrounding mountains and of Mount Kanchenjunga. The villa has five rooms to occupy and each room is available for rent at a price of INR 3,300 per night. A popular destination on the Silk Route , this beautiful hamlet of Rolep in East Sikkim is located 20 km away from Rongli. And the quaint small homestay here overlooks the Rolep River that gushes over the boulders and rocks. A haven for birdwatchers, you can go for a nearby village trail or can also go fishing in the nearby river to catch trout or simply get lost in the tranquillity of this mountain village. One of the attraction you must definitely check out once here is the Buddha Falls. There are four rooms in the homestay and charges for each person per day is INR 1,150, inclusive of meals. This idyllic village lies close to our favourite destination spot of Darj. Located near lower Lamhatta, the Lamahatta Eco Fram House is a perfect place to get close to nature and soak in all its goodness. Spread across 6 acres of land and surrounded by pines, Dhupi and large cardamom trees, this eco village has three rooms and a swimming pool. And with the lush dhupi jungle surrounding it you could also camp in a tent for a camping experience. Per head charges include meals and are priced at INR 2,200. And if you staying in a camp then the charges are INR 1,800.